I'm pretty sure this blog post is more interesting to those who haven't still been in Bali as an exchange student than to those who have already been here or actually are at this moment. You see, this time I'm going to write a little bit about the courses you can study in Bali. Unfortunately I haven't had chance to attend most of the classes because I also have so much other things to do while I'm at the university. Still during this week I've been in most of the classes so that I can write a description about the basics of the courses. Students have to choose at least five of these six courses. I have most experience of this subject because I've been attending most of the Indonesian language classes and I even did the midterm test just to see whether I've learned anything. 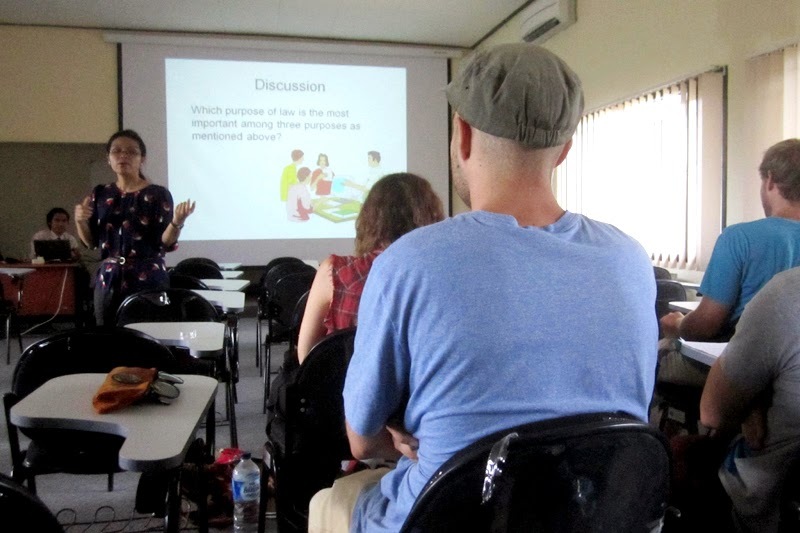 Indonesian language is the only course which has two lessons per week. That's because the idea is of course that students could learn at least good basics of the language during their stay here and that they could really use the language when they're living here. Studying in these lessons is pretty intensive and there may be even 50 new words in one lesson for students to learn. Of course they have to practice using those words after classes. Otherwise it's impossible to remember every new word. Anyway, the phase in Indonesian language classes may be even a little bit faster than in language classes held in Finland. I don't know about universities in other countries so I can't speak about the culture there. Still I've understood that most of the students really like the phase in those courses because that's the way to really learn the language. At most of the time during the lessons students are forming sentences in Indonesian. It's pretty rewarding to see how you can finally communicate with local people with the basic language you've learned. Besides of the new words students are also taught about the basic knowledge of the Idonesian language grammar. 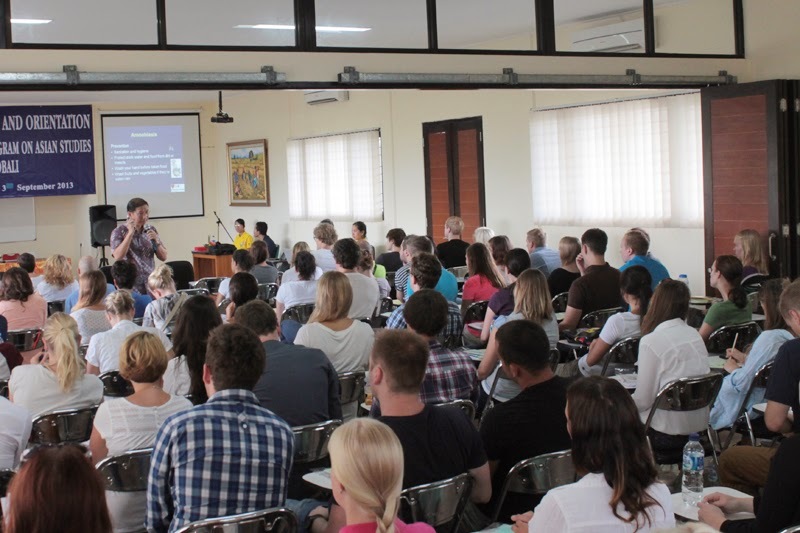 Tourist Management is quite useful and interesting course in this part of the world because especially in Bali there's huge amount of practical knowledge of tourism and how to manage it. That's why the lessons include a lot of good examples about the everyday tourist life here and which help to understand the theoretical side of tourist management. At least I think it's pretty interesting to hear about all those details of the specific tourism here. The basic themes in the whole course are the different kind of tourism strategies and tourism management in Indonesia and also in whole South East Asia. It's easy to see that lecturers have really much knowledge about the subject and they want to share it with the students. I've never studied tourism in Finland so it was interesting to also learn about the theoretical side of tourism. Indonesian Literature course is held on Mondays and there's a little bit smaller group studying that subject than the others. The reason maybe because it's the newest course here and many may not have had that much information about that. I hope there's more students studying that course in the future because I've heard from the students that they really like the course and they think the themes are really interesting. The students learn for example about the Indonesian poetic and the specialties in Indonesian literature. There's many students who are studying cultural subjects in their home country so I think this course is really useful for them. I think it's pretty obvious what's the subject of this course (yeah, it's Indonesian history and culture). What I've understood this was one of the most anticipated course among the students already before the semester because the themes are really interesting and because most of the students don't have possibility to study Indonesian culture or history in their home country. Also most of the students come to study especially because they want to know more about the local culture so that's the perfect way to combine students own interests with the supply of the university. Indonesian culture is really rich: the culture is very different in different parts of the country so there's also numerous things to teach in the classes. 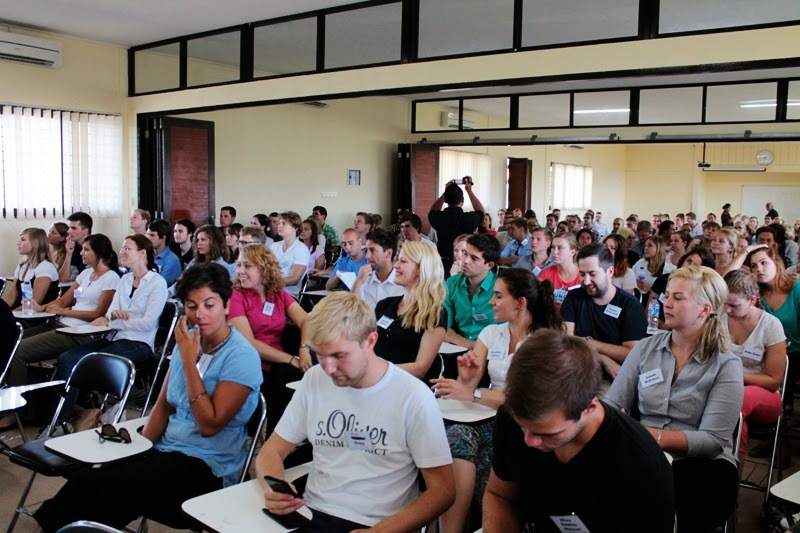 The course about business and economy of South East Asia is of course perfect fit for the business students which are quite big part of our exchange students here in Bali. Still it's quite useful also for other to know more about the local economy as for example Heidi Knutsen said in the interview. I've never studied economy or business in the university but I think it was still really good to attend the class and actually learn some new things about the economy of South East Asia. For the students it's of course even more useful because during the course they're for example trying to figure out together how the local economy can be improved. If I've understood the students correctly, the business law course is one of the most popular during this semester. Many students have praised it for example because the subjects are dealt really widely and because the lecturers are really qualified. Basing on my own experience I have to agree with the students. Lecturers try to raise as much conversation as possible. Although you wouldn't be interested in law normally, this course may still be extremely interesting because besides the legal tradition there's also a lot of talk about the local culture because it affects so many ways to the legal tradition.